Back in the 15th century, tarot cards were used in Europe to play games like Italian tarocchini and French tarot. It was only by 18th century, it was incorporated in the discipline of tarotology or fortune-telling. 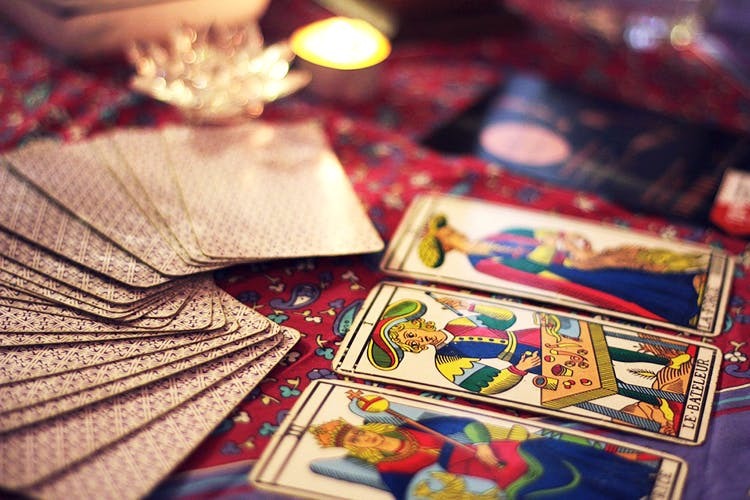 If you’re a believer and want to get an insight in to your past, present and future, here’s a round-up of city’s best tarot card readers. Maayaa Dhami is one of the most sought-after tarot card readers in the city. Although she is based out of Koregaon Park, she often shuffles between Chandigarh and Pune. Therefore, an appointment is a must! What To Expect: She deals with traditional tarot card readings and also does numerology, vastu and Feng Shui. She has a pretty straightforward approach. You can ask her questions related to business, career, relationships, health and education, and she will provide you with her readings. She also deals with crystal, pendulum, rudraksha and gems healing. The Fee: For a standard session of 30 minutes, it’ll cost you INR 1,100. Other services like name, mobile number and signature corrections and gems stone recommendation will also cost INR 1,100. For a complete session of tarot card reading with all corrections, the price is INR 3,500. Based in Ashok Nagar, Kharadi, Tim is a well-known astrologer, tarot card reader and a qualified psychic. What To Expect: Her services include tarot card reading, vedic astrology, kundli making, pendulum dowsing and vastu shastra. If you want to learn tarotology from Tim, write to her at students@timtarot.com. The Fee: For a precise 30-minute consultation on one specific area of life, i.e., career, education, finances and relationships, she charges INR 1,500. If you want to know about two specific areas of your life alongwith remedies, go for 45-minute long session for INR 2,000. Currently, based out of Toronto, Anjali started her career as a tarot card reader in Pune at Bhandarkar Road. Since she travels quite often, you can book an appointment for a Skype, call, mail or MagicJack session. What To Expect: Besides being an expert at tarot card reading, she is also a certified cartomancist, reiki healer, numerologist, signature and handwriting analyst. The Fee: For a 60-minute reading, she charges INR 1,000. The transfer has to be made beforehand. Signature analysis costs about INR 750 and a consultation on numerology will cost you INR 1,500. Based out of Pune, Anisha has been reading tarot cards and offering healing solutions for over 15 years. What To Expect: Anisha combines the discipline of tarot with healing readings. She gives detailed guidelines and solutions regarding issues like love, career, health and more. She also deals with angel messages. Contact: 7718978661; anishahasija1@gmail.com. Anisha is also open to Skype sessions. Although based out of Bandra in Mumbai, Pooja travels to Pune quite often for sessions. Besides, reading tarot cards, she also excels at Angel Card readings, Chinese Astrology, Ancient Runes, Scrips and more.